The $35 Google Chromecast is fantastic Google Chromecast Review and Giveaway Google Chromecast Review and Giveaway We're giving away a Google Chromecast, so read through our review, then join the competition to win! Read More if you want to transfer stuff from phone to TV, and it just got a whole lot better. 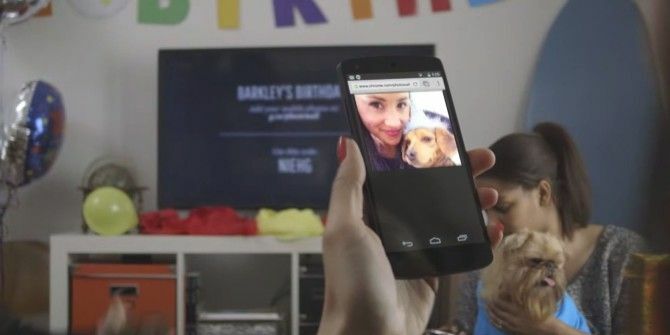 A bunch of Googlers have developed a new app called Photowall which lets many phones transfer images at the same time to a Chromecast-equipped TV, for collaborative photo viewing. We had said that the recently released Google Chromecast SDK will lead to big things With the Release of the Google Chromecast SDK, Expect Big Things With the Release of the Google Chromecast SDK, Expect Big Things Google has released the Google Cast Software Development Kit (SDK) for developers, meaning that there could be a whole new world of entertainment waiting for Chromecast users on their television sets. Read More and this is the first one from Google’s own stable. Photowall will require a Chromecast connected to your TV and a smartphone, with all of those devices simultaneously connected to the same Wi-Fi network. Once you’re set up, you and your friends can start sending photos directly to the big screen. When you’re finished, a YouTube video of your Photowall is automatically generated, which is perfect for sharing with everyone who took part. Photowall is a free app and another one of the creative things you can do with Chromecast 8 Creative Uses for Google's Chromecast 8 Creative Uses for Google's Chromecast We've come up with 8 unique uses for Google's Chromecast. Read on to find out just how you can make even more use of your Chromecast. Read More . It is currently available on iOS and Android [No Longer Available]. Currently, Photowall seems to be available in only a few countries. It didn’t work for us on Indian and Australian IPs, but works fine in the US. Google says you can also try out Photowall without a Chromecast. Explore more about: Chromecast, Photo Sharing.